I’ve never been one to fall for the Ernest Hemingway type — barrel-chested and full of bravado. But I’ve read a few books about Ernest recently and have a bit more respect for the tortured artist that he was. 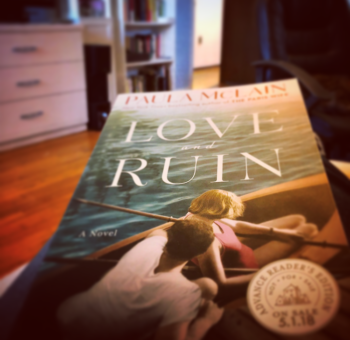 I won an advance reader’s edition of Paula McLain’s forthcoming novel, Love and Ruin, which explores Hemingway’s relationship with fellow writer Martha Gellhorn. It’s one of those tempest-in-a-teapot tales of love and lust, competition and companionship, and, ultimately, the dramatic end of a troubled relationship. I’ve been a fan of Paula McLain for a few years. I love the way that she can tell a story with such beauty. Not only is the story compelling, but her choice of words is a master class in creative writing. I had lived in Paris on and off for years, trying to be a writer and also falling in love a lot, without being terribly successful at either. And yet here we were, anyway, hurtling through the dark toward each other under a hundred million stars, and set to collide disastrously. Logic wouldn’t save us and neither would the dwindling pile of days. We had all the time in the world to make a terrible mistake. He was never yours, a voice in my head said. But what did that matter? I had lost him just the same. I snapped a blank page into the roller, sending a sharp report echoing through the rooms. The page was snowy white. It still held all of its secrets. There was nothing to do but begin. We weren’t in competition, I tried to tell myself. It only felt that way because we were working in the same house, in plain sight of the other’s fire pit. If it happened to be his turn to blaze now, my chance was surely coming. In the meantime, I would lean in close and warm my hands and smile for him. And love him. Real writing, I was beginning to realize, was more like laying bricks than waiting for lightning to strike. It was painstaking. It was manual labor. And sometimes, sometimes if you kept putting the bricks down and let your hands just go on bleeding, and didn’t look up and didn’t stop for anything, the lightning came. Not when you prayed for it, but when you did your work. The book he was writing mattered more than it ever had, I realized. It would outlast all this chaos and senseless death. It would live long after all the stupid things humans did to one another had healed over. That’s what great art was for, I thought. Even when other things come in loud, we have to keep choosing each other. That’s marriage. You can’t only say the words once and think they’ll stick. You have to say them over and over, and then live them out with all you’ve got. I learn more about the craft of writing with each book that I read. What books have you read lately and how have they impacted your work?